When it comes to RV refrigerators you have quite a few options available to you. Whether you're looking for a large RV replacement refrigerator, or you're kitting out a new build or van dwelling and want something more portable, efficiency and size are always your main concerns. This guide aims to help you choose the best RV refrigerator for your setup. Sometimes, it's nice to have options when you are on the road. While there are many people who are on the lookout for full-size refrigerators, there is a lot to be said for having the choice between a unit that can store a few drinks and one that can hold all of your food on the road. 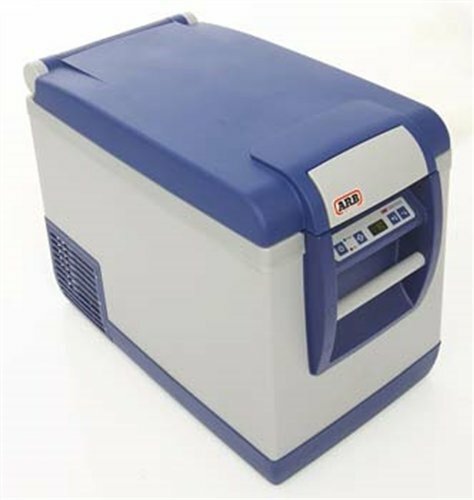 One of the best units that you're going to find is the 10800352 Fridge Freezer from ARB. This portable fridge starts at about 37 quarts, which is about as much space as you need to hold two cases of soda and a few sandwiches. This means that it's a perfect unit for packing a lunch to tide you over from one place to another. If you want to go bigger, though, you can choose an option that can hold up to 82 quarts - more than enough for a long camping trip. You'll almost certainly find an option here that fits your needs, no matter how long you plan to stay on the road. The unit works on DC power in your RV, but it can also plug into a standard AC household outlet. The dual power options mean that you can easily take the fridge inside and keep your drinks cool, making it a perfect traveling companion. No matter which size you choose, this unit also keeps its interior very cold - zero degrees, in fact - and will ensure that anything kept inside will be frosty for your entire trip. Whether you are that will allow you to enjoy a few cold drinks or a larger unit that's going to keep your food fresh, this is the unit for you. If you've ever bought accessories for your RV, you've probably already seen the name Dometic. The company seems to make a little bit of everything, so it should come as no surprise that it has some great RV refrigerators. 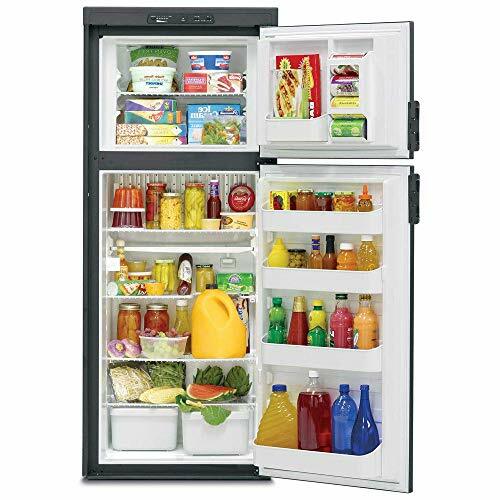 The Americana Double Door RV Refrigerator is a great example of what one should expect from a full-sized RV fridge, with all the little comforts of home included. The first thing you'll notice about this refrigerator is the size. At six cubic feet, you're going to be able to fit quite a few groceries inside with plenty of room to spare. In fact, the unit is so large that it actually has a dedicated space for a gallon of juice or milk, making it much larger than the dorm-style refrigerators many have become used to in the RV world. This is a full-sized refrigerator that will more than impress most users. There's also a lot to like from an ergonomics standpoint. All of the controls are at eye-level, so you won't have to bend down to change any settings. You can remove the various drawers and baskets inside so you can more easily access your goods and to fit larger items inside. The freezer is even separated from the refrigerator, which allows you to make sure that your frozen goods stay frozen while you are on the road. This unit really does feel like the same type of refrigerator that most people use at home. Most people think that portable refrigerators are fairly simple pieces of machinery, basically coolers with a little extra power. The truth, though, is that some of the more modern freezers out there actually have some amazing features that make them perfect for life in an RV. This unit from Dometic is a great example of how far freezers have come, giving users a great deal of control over what they've stored without taking up extra space. At first look, it's possible to mistake this fridge for a very nice freezer. The only lasts until you open it up and you see what's inside. From the powerful interior light to the divided sections, this really does look more like a refrigerator placed on its side than a true cooler. Though the space inside is limited, it's perfect for packing either a significant number of drinks or a few days' worth of food. The unit also has two different power modes, one of which is great for those who are trying to spend a little more time off of the grid. The most impressive features of this cooler are really the little things. The freezer can get down to -7 degrees, but it won't ice up. You can actually control the interior temperature of the unit via wi-fi, and you can even charge your devices through the exterior USB ports. This really feels like it's part of the next generation of RV gear, something that any tech-savvy RV owner will definitely want to look at when they need a portable RV refrigerator. 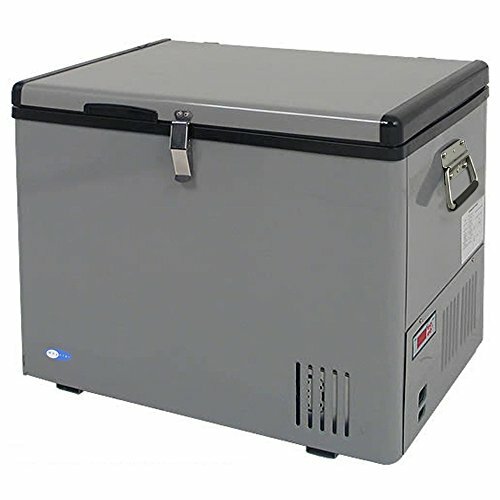 If you're looking for a portable freezer, it's often a good idea to look for something that's sturdy and easy to use. While it's great to have a lot of extra features, sometimes it's nice to just have something rugged and dependable. This unit from Whynter is not only very easy to use, but it feels like it will stand up to the bumps and shocks of the road with. It's a plus, then, that it's also a very user-friendly unit. At about 45 quarts, you've got more space inside this cooler/freezer than you might expect. You can fit about sixty cans inside or several days' worth of food. It's not quite big enough to replace a traditional freezer, but it's more than enough for your average camping trip. The entire unit is very easy to move and it will certainly handle moving around much easier than some of the other models on the market today. Consider this one a good fit for anyone who plans on moving around his or her portable freezer quite a bit. While it's short on fancy features, there are a couple of neat extras here. The best is the fast-freeze mode, which cools the interior down to -8 degrees in mere moments. The unit's also very easy to switch from cooler mode to freezer mode, so you can swap out your cans for ice cream with no trouble at all. In fact, this really is one of the easiest-to-use portable units that you will find on the market today. This is one of the best freezers for those who just want something that's going to work. 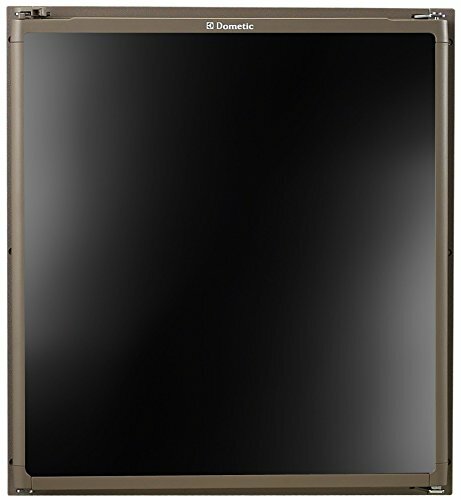 Depth 21 7/16 " ; Height 21 9/16 " ; Width 19 5/16 "
Dometic makes RV refrigerators in virtually all sizes, and this unit is a good example of what it can do for those who don't have a lot of room. While this might look like a traditional dorm-size refrigerator from the outside, it's what's on the inside that counts. 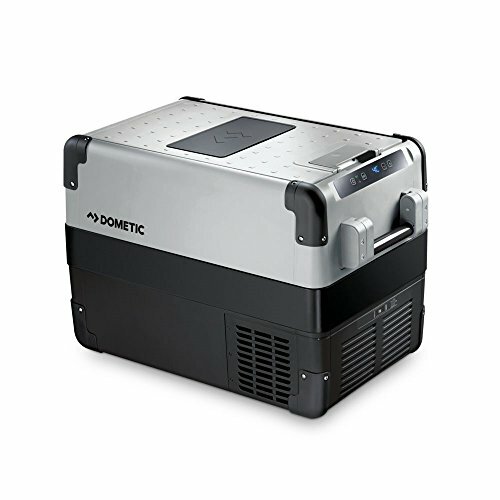 If you want a solid compact freezer that's also fairly easy to move around, Dometic has you covered with this unit. If you've ever used a compact refrigerator before, you largely know what you're going to get here. It's small, but still big enough to fit a few days' worth of food inside. You're not going to get a lot of freezer capacity inside, but what you will get is a place to keep your perishable food cool until you get to your next permanent stop. While the unit is definitely portable, it can also serve as a realy nice under-counter unit for those who just want a small cold storage space in their RVs. There's just enough space here to warrant considering this as a permanent RV addition rather than just as a portable unit. While it's short on things like USB inputs or Wi-Fi connectivity, it makes up for the fact by being very well-engineered and staying cold even if you can only have it on temporary battery power. 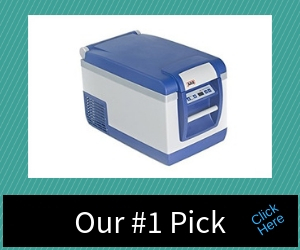 There are certainly bigger models out there and there are certainly models that do the entire portability thing wiht more gusto, but there are few that can so easily serve as both types of unit. Before you buy an RV refrigerator, you might want to spend some time trying to figure out exactly why you're buying the product. 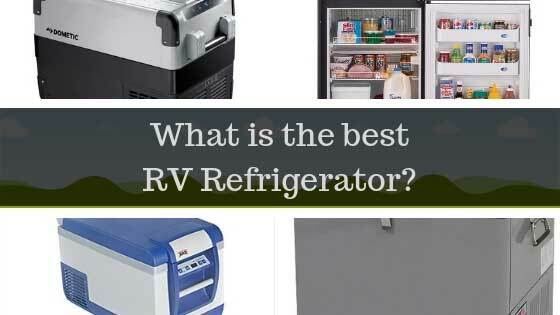 While these refrigerators can be a fantastic addition to your RV, there are many different models and many different reasons for choosing to buy them. Before you choose from one of the best reviewed models available today, you'll want to gather all of the information that's relevant to your search. Fortunately, this buying guide should give you not only a good idea of the reasons why you might want an RV refrigerator, but a good idea as to what you need to look for when you're making your purchase. There are a few things that you'll want to know before you buy your RV refrigerator. These factors will not only help you to figure out whether you need an RV refrigerator, but exactly what factors you need to prioritize when you go shopping. Knowing each of these factors will give you a better chance of buying the refrigerator you need and help you to avoid a purchase that will leave you wondering why you bothered buying a refrigerator in the first place. Take a moment to look at your RV and look at your power hookups. Does your RV have the ability to plug in appliances? If so, can it handle something as large as a refrigerator? If not, do you have the space to store batteries or other types of power? It's also a good idea to stop and look at whether or not you have any type of gas hookups (or the space for propane storage) in your RV so you can expand your options. How much space do you have in your RV? Do you have room for a full-size refrigerator, or is space at a premium? At the very least, take measurements to determine exactly how large of a unit you can use in your RV. You certainly don't have to use up all of your space, of course, but you should be prepared to bring something large into your RV. Always make sure that you measure in front of where the unit will go to make sure that you actually have room to open up the refrigerator doors. The biggest thing to think about before you buy a refrigerator is why you need a refrigerator in the first place. Do you stay on the road long enough to store food on a regular basis? If not, how often do you think that you need to keep things in cold storage. If you are just looking to keep a few drinks cold while you're travelling, you might want to save money and just buy a cooler. If you need to store food, try to think about how much you generally bring with you and how much you'd like to take when you're on the road. Knowing what you need is hte best way to ensure that you buy the right refrigerator for your RV. There are many types of RV refrigerators. Taking some time to look at the basic features is the best way to determine which will work best for you. Below are five features that will help you to decide between some of the best refrigerators on the market today. Perhaps the most important thing to look at when you're shopping for an RV refrigerator is size. Size is everything, because it's going to determine exactly how your refrigerator can be used. A small refrigerator is great if you're just looking for somewhere to store drinks, for example, but it's not going to help you very much if you're looking to pack several days' worth of meals while you are on the road. While there's a little bit of wiggle room on most of the other factors on this list, this is the one that has to be precise. As a rule, it's usually a good idea to go one size larger than you absolutely think you need. This gives you the ability to have a little extra refrigeration space without having to worry about leaving anything behind. Always measure before you buy a refrigerator, though, as you don't want to be stuck with something that won't fit in your RV. Cost is another major factor. 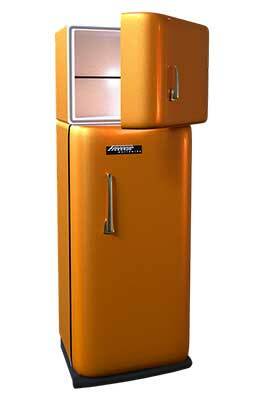 The good news about RV refrigerators is that there are many very low cost models on the market. The bad news, though, is that the really good refrigerators can get very pricey. You won't pay quite as much for a good RV refrigerator as you would for one in your home, but it can often feel like the prices get uncomfortably close. Your goal, then, should be to look for something that fits your needs as well as your budget. A good idea might be to start by looking at the other factors on this list and then trying to figure out which factors will impact your budget the most. Trying to buy something that's the cheapest possible item on the list might be problematic, but don't buy into the idea that the best refrigerators are always the most expensive. No matter what your budget, you'll probably find a great refrigerator that will at least serve your basic needs. Power is a major issue when it comes to RV refrigerator. You're going to have to pay very careful attention to the power source for any refrigerator, as it will not only determine the price of what you're getting but also the ease of use. RV refrigerators tend to either work off electrical power (your hookups), gas power, or off of battery power. The former tends to be the closest to the models that you'll see in a home, while the latter will be portable. The gas models tend to require a lot of work, but they also tend to be the most work for those who haven't installed an RV refrigerator in the past. In general, your choice of power source is going to have more to do with your own personal needs than with any tips that this article can get you. If gas works for you, get gas. If you prefer electric, just decide whether you're looking for a permanent unit or something more portable. Once you make your choice, you'll be able to find the refrigerator you need. Capacity is the cousin to size and is perhaps more important than the former factor. If size is how big the refrigerator is, capacity is how much it can hold. You'll want to take a look at not only how many cubic feet the interior of the unit is rated to hold, but also how that space is divided between cold storage and freezer storage. If you're looking to carry around food for a long time or you need more frozen space, you're going to want to make sure that your refrigerator has a larger freezer capacity. The longer you want to stay on the road, the more important capacity can be. You'll want to pay close to attention to see if the capacity of the refrigerator is large enough to hold large food items or if it is only rated to hold smaller items. Always make sure you can store the food and drinks that are most important to you while you are on the road. It's also a good idea to double-check to make sure that the unit at which you are looking has both the refrigerator and freezer capacity that you need. Finally, take a moment to look at special features before you make your choice. Just as with traditional refrigerators, RV refrigerators have a whole host of extras that might not necessarily make them better than the competition, but that might make your life easier. This might range from having a two-door refrigerator to having some kind of 'smart' system included with the unit, but you'll always be able to find some interesting extra features when you shop. Only you know if the extras are really worth looking at. Some of these extras are quality of life issues that will make it easier for you to use the refrigerator. Others, though, are just gimmicks that drive up the price. Make sure you know what you need before you get sucked in by clever marketing language. In the end, though, it may be these features that help you to determine that one great refrigerator is a little better than another in its price category. Always make sure you pay attention to the features above before you choose an RV refrigerator. With a little work, you'll find something that's got the size, capacity, power source, and features that you want at a price you can afford. The best refrigerators out there are those that not only work well, but that can fit your needs in a way that other refrigerators simply cannot match.